Once Upon A Time Ago, before the Millennials were born, there were only two ways people could watch movies. The first was to go out to something called a theater and watch movies on the big screen. There were no recliners in the theaters at that time, but people didn't mind. They didn't know any better. The second was to sit in front of a television and watch a movie on a commercial station. That means the movie would be interrupted regularly with things called commercials - advertisements for things, services and restaurants you didn't realize you needed to experience prior to seeing the ad for them. It was a strange time before cable, satellite, or home computers existed, and before there was a way to rent - or buy - movies. Don't worry, kids. This was over forty years ago. Since then, lots and lots of changes have happened. In fact, 1976 was the year VHS videocassettes were first introduced - those are generally black plastic rectangles with lots and lots of shiny stuff inside called tape. If you wanted to ruin someone's day, you could pull the tape out of the cassette to see just how much there was. Your mom and dad probably owned a bunch of videocassettes when they were your age. 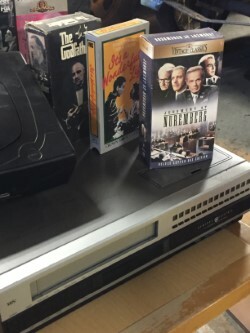 We have a bunch of these "tapes" as they were more popularly called back in the day, here at the American Treasure Tour, but only a small sampling on display. They're kind of in the background. If you want to see them, look for the small green alien with the sign for Grovers Mill. They're next to that guy. VHS was the cheapest way to get movies until DVD's were introduced, but there were other formats in there, too.